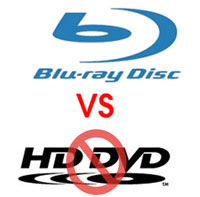 TOKYO — Blaming the loss of support from a key movie studio, Toshiba Corp. said it is pulling out of the HD DVD business, handing victory to Sony Corp.'s Blu-ray technology in the fierce format war over high-definition DVDs. So with the demise of HD-DVD, what to do with your HD-DVD player now? Engadget tackles that question in their post today titled, “Top ten things to do with your now-defunct HD DVD player.